Not to be confused with Big Bullet Bill. Banzai Bills (also known as Magnum Bills in the Super Mario World television series) are a larger variety of Bullet Bills that first appear in Super Mario World. Their attack pattern usually consists of shooting from off-screen (though occasionally, players can see them being fired from Banzai Bill Cannons) where a firing sound is played to alert players that they are incoming, and they travel toward players in a straight line. To avoid them, players can either jump on higher platforms or duck in lower areas of the stage. As with all Bullet Bill varieties, jumping on them or using a star on them are the only ways to defeat them, as they are immune to fireballs and break out very quickly if they are frozen with ice balls. While Banzai Bills share the same black coloration and physical characteristics as Bullet Bills, Banzai Bills lack arms and have a mouth in the form of a shark smile. They are the second-largest derived species of Bullet Bills, after the King Bill. The word "banzai" is a Japanese interjection mainly used for jubilation or celebration, frequently translated as "Hooray!" Artwork of a Banzai Bill from Super Mario World. In Super Mario World and its remake, Super Mario World: Super Mario Advance 2, Banzai Bills are fired from somewhere off-screen and travel towards Mario in a straight line. The player can defeat them by jumping on top of them or by running into them with the use of a Star. Banzai Bills appear in three levels, Yoshi's Island 1, Valley of Bowser 3, and Awesome. In Yoshi's Island 1, the first level of the game, players have indicators that the Banzai Bills are approaching, some of which are marked by indentations on the ground. A total of four Banzai Bills spawn in this level. Players can hop into these indentations to avoid the Banzai Bills. The first Banzai Bill has no indentations, but players can duck to avoid it. Two Banzai Bills spawn near a segment with a Trampoline and cloud platforms on the top, though both Banzai Bills have an indentation on the ground for players to hide in. The cloud platforms on the top can be used to avoid the incoming Banzai Bill as well. The fourth and last Banzai Bill of the level is not marked by an indentation, but players can avoid it by hopping on a platform nearby. In Valley of Bowser 3, a total of three Banzai Bills appear, and they all spawn near the end of the level where there are no stationary platforms. In Awesome, four Banzai Bills appear in the level, and they all spawn in the area with purple-colored pillars and platforms and blue Warp Pipes. As SNES sprites are limited to 64×64 pixels, the in-game Banzai Bills appear to be flatter horizontally than depicted in artwork. When players complete the Special World in Super Mario World (or get all 96 exits in its remake), unlocking Fall, Banzai Bills do not change sprites, unlike the Bullet Bills, which change into Pidgit Bills. Banzai Bills reappear in New Super Mario Bros.. They retain most of their design from their Super Mario World counterparts, except that their coloring has a slight purple hue and they have red shadows under their eyes to make them look more intimidating. However, their animation has been changed and they now spin instead of staying in one position. In this game, Banzai Bills are fired from huge Banzai Bill Cannons (unlike Super Mario World, where they are fired from an unknown source). Banzai Bills make rarer appearances than they do in Super Mario World. They are always fired from a specific source, the Banzai Bill Cannon, which appears only once per level they appear in, and all Banzai Bill Cannons appear at the end their two level appearances in the game, World 7-5 and World 8-1 just before the flagpole. As with Super Mario World, they can be defeated with a jump, through the use of a Star, or with a Mega Mushroom. Players, when powered up with a Mega Mushroom, can additionally destroy Banzai Bill Cannons as well. 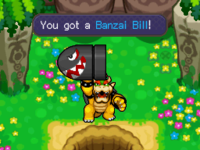 A Banzai Bill from Super Mario Galaxy. Banzai Bills make their first 3D appearance in Super Mario Galaxy, though they appear only in the game's last level, Bowser's Galaxy Reactor, in the mission The Fate of the Universe, and they retain their appearance from Super Mario World, lacking the red highlights on their eyes. They are found on the Lava Tower Planet, a tunnel-shaped planet filled with lava and square-shaped platforms. As with New Super Mario Bros., they are fired out of specific Banzai Bill Cannons at a set rate, and, due to the additional 3D space, comes in rows and lines. They do not home in on Mario's or Luigi's position as how Bullet Bills behave, though their size makes them more difficult to avoid. To avoid them, Mario or Luigi must wait until one passes by, or attempt to backflip over it. Because Banzai Bills are fired in a pattern, Mario and Luigi can also find patterns where it is safe to pass by them. If a Banzai Bill touches Mario or Luigi, he is knocked away. They are indestructible in this game, as jumping on them does not defeat them, unlike in the 2D platformers. Banzai Bills in New Super Mario Bros. Wii. Banzai Bills appear again in New Super Mario Bros. Wii, where they keep their pattern and role from New Super Mario Bros.. They are mostly seen in World 7, the cloud-themed level of the game. In World 7- , when players are further up the tower via the use of the ascending pulley on the first room of the tower, after they pass the normal Bullet Bills, players encounter a column of hidden Banzai Bill Cannons, which are indicated by the rate of fire of the Banzai Bills. Players need to adjust the pulley with their Wii Remote sensor to steer them away from the path of the Banzai Bill. Banzai Bills reappear in World 7-4, and they are seen alongside with the game's only visible Banzai Bill Cannon. Banzai Bills are encountered in the second area of the level, where players need to dodge Banzai Bills by platforming across moving Warp Pipes to access the only stationary red Warp Pipe on the screen. Banzai Bills can be jumped on to either defeat them or to reach higher areas. As with most enlarged versions of enemies, an Ice Flower freezes them only very briefly and this does not halt their progression on their path. This game introduces homing varieties of the Banzai Bill in World 9-3, as well as the even larger and indestructible King Bills, which appear in World 9-8. Banzai Bills appear in Super Mario Galaxy 2, keeping their attack patterns and durability from Super Mario Galaxy. This time, they appear more frequently in more levels, rather than being tied exclusively to the last level of the game. They can be defeated by either using a Rainbow Star or the Spin Drill and award a large number of Star Bits. Banzai Bills are first encountered in Sky Station Galaxy in the mission, Storming the Sky Fleet. The planet, the Sky Fleet Ship, has a long line of Banzai Bills, where players must avoid them by running around them until they find a hole they can drop into. In this level, players can use a Rainbow Star to defeat them by running into them as Rainbow Mario. In Bowser Jr.'s Fearsome Fleet in the missions Bowser Jr.'s Mighty Megahammer and Megahammer's Daredevil Bash, they are spawned during the fight with Megahammer; the center of Megahammer's chest cavity contains a cannon that can fire a single Banzai Bill, though Megahammer additionally fires several Bullet Bills as well. Banzai Bills are featured as obstacles in Fleet Glide Galaxy and two missions, Fluzzard's Wild Battlefield Glide and Fastest Feathers in the Galaxy, where Mario or Luigi rides Fluzzard to the finish line. Their last appearance is in Bowser's Galaxy Generator in the mission, Bowser's Fortified Fortress, where they are exclusively located on a cylindrical planet. Players can dodge their line of fire by using the Spin Drill to dig through the dirt. The Spin Drill is also the only other object in the game that can defeat Banzai Bills. During Bowser's Big Bad Speed Run, the Banzai Bills are replaced by Octoombas. Banzai Bills in Super Mario 3D Land. In Super Mario 3D Land, Banzai Bills start appearing in World 8-5 and are more common in the special worlds, appearing in three levels of the game. These Banzai Bills appear to be more similar to their Super Mario World counterparts than the Banzai Bills in later games, as they lack the red highlights on their eyes and do not spin around when fired. Unlike their other 3D iterations, they can be defeated by being jumped on; other methods of defeating them include touching them as Statue Mario or using a Boomerang thrown by Boomerang Mario. In World 8-5, the players need to dodge the line of incoming Banzai Bills while traversing through Reversible Platforms. They later reappear in the special level Special 2- , where players can snag the second Star Medal of the level directly in front of the Banzai Bill Cannon. Later in the level, players need to avoid Banzai Bills while navigating through Donut Lifts and avoiding Spike Platforms. In Special 4-3, players are chased by Banzai Bills while they are on the wooden bridge, after experiencing many pairs of Bullet Bills beforehand. Banzai Bills appear in New Super Mario Bros. 2, retaining their attack patterns from previous titles. Whenever Mario touches a Gold Ring, Banzai Bills turn gold. In this state, they leave a trail of two rows of coins behind them. Players additionally can defeat Banzai Bills with gold fireballs when they are powered up into Gold Mario via the Gold Flower. Banzai Bills first appear in World 5-5, where a single Banzai Bill Cannon that blasts Banzai Bills is found at the end of the level. Players can obtain the third Star Coin near the Banzai Bill Cannon by using Bullet Bills to grab the Star Coin. In World 6-B, past the Checkpoint Flag, players encounter and dodge Bullet Bills and Banzai Bills fired at them while riding on a moving, colored platform. Regarding the DLC content of the game, Banzai Bills appear in Coin Challenge Pack B, in the sky-themed Second Course level of the pack and Platform Panic Pack, in the subterranean lava-themed Third Course level of the pack. In Second Course of Coin Challenge Pack B, Banzai Bills appear in the latter portion of the second area of the level, where players can make use of Gold Rings to make Banzai Bills drop coins behind them. In Third Course of Platform Panic Pack, in the first Spine Coaster ride, one Banzai Bill is fired at the end of the ride. In the second Spine Coaster ride past the Midpoint Flag, three Banzai Bills are fired near the end of the area past where the P-Switch falls down, with each Banzai Bill being higher than the last, where they can be used akin to stepping stones. Banzai Bills also appear in New Super Mario Bros. U and its port, New Super Mario Bros. U Deluxe, where they make their only appearance in the level Scaling the Mountainside in the Frosted Glacier world. They operate in the same manner as in New Super Mario Bros. Wii. In Scaling the Mountainside, players need to dodge incoming Banzai Bills through the use of platform pulleys near the end of the level. The Banzai Bill Cannon can then be found at the end of the level, where players can use it as a platform to reach the flagpole. Banzai Bills also appear in the expansion pack game to New Super Mario Bros. U, New Super Luigi U, this time in the Weighty Waddlewings level, where they are very common along with the Banzai Bill Cannon. In a similar parallel to New Super Mario Bros. U's Scaling the Mountainside, this level is also snow-themed and has the similar function of using platform pulleys to navigate through the level. This level features only Banzai Bills and no regular Bullet Bills at all. A few Banzai Bills are also seen in the first area Larry's Trigger-Happy Castle, where all other Bullet Bill varieties can be found, including Torpedo Teds and King Bills; these Banzai Bills are fired from offscreen areas rather than from Banzai Bill Cannons. In Para-Beetle Parade, four Banzai Bills are also fired from offscreen areas while players are attempting to navigate the skies with Para-Beetles and Heavy Para-Beetles. They start appearing soon after the first Star Coin is collected, guarded by a Big Piranha Plant. These four Banzai Bills are required to be used as stepping stones to proceed further on the level, towards Para-Beetles that are out of reach by other means. Banzai Bills return in Super Mario 3D World, with the same attack pattern as in previous games, and they appear in a total of two levels in the game. The game also introduces the Cat Banzai Bill, a new variety of Banzai Bill. Unlike in previous games, Banzai Bills in Super Mario 3D World have blue flame thrusting them through the air, while they used red flame in preceding games. Compared to their appearance in Super Mario 3D Land, their eyes have the red highlights present in the New Super Mario Bros. games, but they do not spin around when they are fired, retaining their static animation when flying. Incidentally, Cat Banzai Bills appear before regular Banzai Bills, where these variants appear in The Bullet Bill Express of World 3. Regular Banzai Bills do not appear until Mystery House Mad Dash of World 4, where players need to avoid them and Crates to obtain the third Green Star. In Bullet Bill Base, Banzai Bills appear in the latter part of the level, after the player touches the Midpoint Flag and traverses past the permeable cloud platforms on the way up. This area has a large amount of space to accommodate for the larger size of the Banzai Bill. A captured Banzai Bill in Super Mario Odyssey. Banzai Bills appear in Super Mario Odyssey, where they can be found in bonus rooms of the Wooded Kingdom, the Snow Kingdom, the Dark Side, and the Underground Moon Caverns in the Moon Kingdom, where they wear top hats. Like the New Super Mario Bros. games, they have red shadows behind their eyes, and like their Super Mario World and Super Mario 3D World appearances, they don't spin while moving. They now sometimes home onto Mario similarly to the Cat Banzai Bill instead of always moving in a straight line like previous 3D appearances. They emit music similarly to Chargin' Chucks in this game, which gets louder and more intense when Mario moves around with it. When launched from Banzai Bill Cannons, they destroy stone blocks and everything in their path. Like regular Bullet Bills, they explode after a little while. Mario can capture some Banzai Bills with Cappy, allowing him to fly over pits, destroy stone blocks and defeat Bullet Bills that run into him without blowing up himself. They also tend to last much longer before exploding while captured than regular Bullet Bills. Banzai Bills appears as enemies in Super Mario Maker 2. They can be fired from Banzai Bill Cannons placed in the background, moving towards the screen. They can also be fired regularly, and can defeat enemies such as Goombas by running into them. A Magnum Bill from the Super Mario World animated series. In Super Smash Bros., golden Banzai Bills are fired from Master Hand in one of his moves. These are replaced by generic golden bullets in future installments. A Banzai Bill in Super Smash Bros. for Nintendo 3DS. In Super Smash Bros. Ultimate, Banzai Bills reprise their role on the Princess Peach's Castle stage from Super Smash Bros. Melee. They keep their rotor-like back ends from the original, but other than that resemble their current design. Compared to their original appearance, the explosion they leave behind lasts longer. They also appear as an Attack-type, Advanced class spirit. They can be obtained when players level up a Bullet Bill to level 99 and enhance them. When players equip them, they give players the ability to cause damage by running into other players. Banzai Bills make rare appearances in the Mario Kart series, physically appearing in one game while having a kart design based after it in two other games. They make their only physical appearance in Mario Kart 7, where they appear in DS Airship Fortress as obstacles, replacing the Bullet Bills fired out of the cannons. They travel in a straight line and any player who touches the Banzai Bill gets flipped over. Two vehicles in the Mario Kart series are designed after the Banzai Bill. Bowser Jr.'s unlockable kart, the Bullet Blaster, in Mario Kart: Double Dash!! has its design based after the Banzai Bill. In Mario Kart Arcade GP DX, the Road Jetter is an airplane-based vehicle that has the design of a Banzai Bill on the front of the vehicle. Banzai Bills reappear in Super Princess Peach, where they act the same way they did in Super Mario World, having a similar appearance as well, though they do not perform their tell-tale firing sound to alert players that they are going to appear on the screen. Despite their large size, players can still pick them up and eat them with Perry to replenish the Vibe Gauge if they press on them, and Peach can defeat them if she swings Perry at the right moment. They first appear in the world, Hoo's Wood with their first level appearance being in Hoo's Wood 2-4, where they appear in an area where the second Toad is found, after the player uses the Gloom vibe on the water wheel. They are later seen in Gleam Glacier 6-3, in an auto-sidescrolling section in the latter, penultimate area of the level where they get fired at the player from the right. In Giddy Sky 7-2, Banzai Bills appear throughout this area after the second darkened lightning cloud segment of the stage, being the fifth area of the stage. In Giddy Sky 7-5, Banzai Bills appear in the fifth, windy segment of the stage, where they appear randomly around the stage, generally aiming for the player. This game also introduces a red, more dangerous variant of Banzai Bills known as Mad Banzai Bills, which fly faster than normal Banzai Bills. "An enormous, black, shiny weapon. If it's launched at you, you're toast!" A Banzai Bill appears in Mario & Luigi: Bowser's Inside Story as a key item. In Dimble Wood, Bowser sees Private Goomp, Corporal Paraplonk and Sergeant Guy carrying a Banzai Bill Cannon. They explain to Bowser that they are going to fire a Banzai Bill to Bowser's Castle, which is taken over by Fawful, as payback. The three, however, do not have any Banzai Bills; Bowser has to search one on his own. It seems that a Wiggler on a farm has a Banzai Bill after Bowser pulled out his Giga-Carrot, which Bowser has to eat. He was originally going to use the carrot as a substitute for the Banzai Bill, though the Wiggler tells him to eat it as a responsibility. After the carrot is eaten up, Bowser could choose to save or to get the Banzai Bill right now. Once he asks for the Banzai Bill, the Wiggler gets mad because Bowser pulled out the carrot and ate it, even though he told Bowser to do so. After battle, Bowser finally gets the Banzai Bill and gives it to Private Goomp, Corporal Paraplonk and Sergeant Guy, which is then launched at Bowser's former castle. However, Midbus and two other Goombas see the Banzai Bill and dodge it by making the castle fly into the air. The castle then heads for Bowser, lands on him, and initiates the first Giant Bowser battle. The Banzai Bill is not seen again for the rest of the game. It reprises its role in the remake, and is used in the Banzai Bill Thrill first officer command that Roy can use in the Bowser Jr.'s Journey mode. Banzai Bills appear in Paper Mario: Sticker Star, in which Bowser Jr. fires one from his airship of Bowser Jr.'s Flotilla to prevent Mario and Kersti from reaching Bowser's Castle. Later in the level, Mario paperizes the Banzai Bill Cannon to shoot a Banzai Bill, making a huge hole in the flotilla. If Mario is hit by these Banzai Bills, they take away 30 HP. They were originally planned to be fought, but they were cut from the final game. A Banzai Bill about to crash into the ground in Sunglow Ridge. Banzai Bill as it appears in Mario Party: Island Tour. A Banzai Bill appears in Mario Party: Island Tour as the main gimmick of the Banzai Bill's Mad Mountain board. If a player rolls the die and rolls the Banzai Bill icon, the Banzai Bill will shoot out of its cannon and knock the players to the last checkpoint. However, the Banzai Bill can travel only along the lower path or the upper path at any given time. When players pass the Switch Space, the Banzai Bill changes course to hit the upper area of the mountain. The Banzai Bill can also get launched when players land on a Banzai Bill Space, which is located just before the Goal Space. At the end of the match, the game keeps track of various records relating to the Banzai Bill, such as how many times a player launched the Banzai Bill and how many spaces a player got knocked back by it. Banzai Bills appear in a Mario Party 10 minigame, where they are summoned by Kamek in the second half of the in Kamek's Rocket Rampage when Kamek gets half of his health depleted. These are larger and therefore more difficult to dodge than the normal Bullet Bills he spawns. Banzai Bills take three points away if players get hit by them, which is the most damaging enemy in this minigame. In the Airship Central board, players can buy and unlock a jet designed after a Banzai Bill to ride in. The Banzai Bill's team image from Puzzle & Dragons: Super Mario Bros. Edition. Banzai Bills appear as enemies in Puzzle & Dragons: Super Mario Bros. Edition. Their main attribute is Dark, while their sub-attribute is Light. As enemies, the player does not fight Banzai Bills directly, fighting their Banzai Bill Cannons instead. Banzai Bills always begin the battle with first strike blows and attacks the player's team every single turn. However, they may also use a turn to use their Skill Armor Break, which increases their ATK while also lowering their defense. Because Banzai Bill Cannons are larger than the Bill Blasters, Banzai Bills are never allied with any other enemies. Interestingly, the Banzai Bill Cannons in this game are shaped like larger Bill Blasters. As allies, Banzai Bills can use Armor Break to greatly reduce the defense of all the enemies on the field for two turns. The player can acquire a Banzai Bill by using four Fire Flowers on a Bullet Bill. The Banzai Bill will transform into a King Bill when given six Fire Flowers. The Banzai Bills' strongest stat is their ATK with a rating of 6/6, while their HP is rather low with a rating of 2/6. Lastly, their RCV rating is 0/6. Banzai Bills use Green Star Coins and Grand Green Star Coins to increase their Skill levels. The Banzai Bill caught in underwear in Mario + Rabbids Kingdom Battle. A Banzai Bill can also be seen in the background of Undergarment Gulch, ensnared in a giant pair of underwear. After defeating the Icicle Golem, it can also be found outside Peach's Castle, still caught in underwear. Notably, this is the first time a Banzai Bill has been shown with a different expression. Banzai Bills, being a derivative species from the Bullet Bills, are large, anthropomorphized bullet enemies that can either be fired from a Banzai Bill Cannon or from a cannon off-screen, where the only cues the players receive that they are coming are the firing sounds heard. Due to their large size and immunity to most attacks, they often are required to be dodged either by maneuvering around them, jumping on higher ground, or by ducking if lower ground is available. In some games, Banzai Bills are weak to jumps on top of them like normal Bullet Bills while other games, the only way to defeat them is if players run into them while they are invincible. 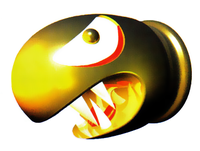 The Banzai Bill retains most physical characteristics from Bullet Bills, which includes the bullet-like shape, the jet-black, shiny coloration, and angry eyes. However, key differences from Bullet Bills include the lack of arms on the Banzai Bill and that all Banzai Bills have mouths, which is constantly open and filled with sharp teeth, giving them a shark-like appearance. In most games after New Super Mario Bros., their design has been updated to add red highlights to their eyes, as well as their animation has been tweaked so they twirl around when fired rather than their original static pose. In some games, notably the Super Smash Bros. and Paper Mario series, they have the ability to dig into walls and release a huge explosion. A Bullet Bill from Yoshi's Story, which looks similar to a Banzai Bill. In several games, Bullet Bills have appearances that resemble more like Banzai Bills than they do traditional Bullet Bills, including, but not limited to, most appearances in the Yoshi series, Super Mario Land 2: 6 Golden Coins, and Super Mario 64. In these games, Bullet Bills are depicted with no arms and with an angry smile with sharp teeth, these traits being similar to Banzai Bills. The only element retained from regular Bullet Bills are their size. 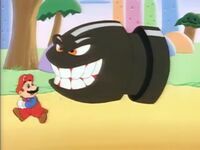 With the exception of Super Mario World, Banzai Bills are typically encountered as late-game enemies and their appearance, alongside their Banzai Bill Cannon, usually signifies the end of the level. They are typically found in athletic-themed levels, that is, levels that focus on platforming on higher elevations with many pits. Banzai Bills are usually the last enemies encountered in levels that are featured around many Bullet Bills and Bill Blasters. The only games that feature Banzai Bills in a subterranean setting are Super Mario World's Valley of Bowser 3 and New Super Mario Bros. 2's Course 2 of the Platform Panic Pack. Their English namesake, "Banzai" comes from the Japanese interjection, which is usually translated to "Hurray!" Their Japanese name, "Magnum", refers to their very large size in comparison to most enemies in the Mario series. Most languages have adopted either the English or Japanese versions of the name, with a few exceptions, one example being the German name, "Riesen-Kugelwilli", meaning "Giant Bullet Willi" where "Willi" is the German equivalent of "Bill". 10/85 Bullet Bills are shot out of cannons and fly on straight paths. In great numbers they're a nightmare; while Mario can stop most with a single jump, the giant one, Banzai Bill, is much tougher to avoid. In Super Smash Bros. Melee, only Banzai Bills can be seen. They burrow into Princess Peach's castle and then detonate with immense power. Wii New Super Mario Bros. Wii (11/2009) A giant bullet-like menace from the Mario series. In Smash Run, they want nothing more than to blow up on you. If you trick them into crashing, they'll get stuck and blow up soon after. Beware that lethal blast radius! Beat one before it blows up to get a banzai bonanza of stats. Tricky, but well worth the effort! A giant bullety menace from the Mario series. In Smash Run, they want nothing more than to blow up on you. If you trick them into crashing, they'll get stuck and blow up soon after. Their blast radius is lethal, so keep well back! Beat one before it blows up to get a banzai bonanza of stat boosts. Not easy, but well worth it! This giant bullety menace from the Mario series might look tough, but one jump is typically all it takes to deal with it! In Smash Tour, a Banzai Bill will sometimes charge into a space and explode, destroying any items there. Players caught in the blast will be launched to another space. 61 Banzai Bill It's huge! But you can pick it up with the X Button! For this subject's image gallery, see Gallery:Banzai Bill. In the Prima Player's Guide for New Super Mario Bros. Wii, Banzai Bills are mistakenly called King Bills, despite being different enemies. ↑ Bueno, Fernando. New Super Mario Bros. Wii Prima Official Game Guide. Pages 16 and 138. This page was last edited on March 15, 2019, at 01:27.